NOTE: This article was originally posted in the summer of 2014. It is being republished to offer a refresher to parents for their children’s arrival back home from camp. Charles Dickens’ opening line of A Tale of Two Cities may be the most accurate description of a camper’s transition home after an incredible summer at camp. As many of you have seen, since your happy camper has returned home, there has been a range of emotions from utter joy to sheer sadness, anxiety and exhaustion to laughter, and everything in between. From my time as a Camp Director, and my years of being a camper myself, I can tell you that when the emotions of “there’s no place like home” crashes into the emotions of leaving “my summer home,” it can be very overwhelming for everyone. Throw into the mix the impending start of a new school year, and suddenly, younger children are having simultaneous (and conflicting) emotions that they have never had before. Older children are filled with so many emotions, that they can’t truly identify everything that they are feeling. This is all a normal part of making the transition back home after spending the summer away at camp. It goes without saying that campers missed their parents, their siblings and even the family pet while they were at camp. After all, leaving the most important people in your life is hard. On the bus ride home, campers look forward to seeing their families and hugging them. They look forward to spending lots of time with their families, sharing stories about their summer and getting tucked into bed at night. There is also a massive appeal to sleeping in your own bed, eating your favorite foods on your own schedule and getting showered with love and affection, so in some ways, coming home feels like winning the lottery. Campers also look forward to resting, recharging and reconnecting (both emotionally and technologically speaking). However, after being “unplugged” for seven weeks, campers’ senses may be overwhelmed as they reacclimate to screen time (TV, computer, iPhone, iTouch, video games, etc.). Even though campers are happy to be home, they do miss their camp friends, counselors, activities, being outdoors and even the routine and fun of camp. Who can blame them? Once they adjusted to being away from home at the beginning of the summer, they spent seven weeks independently thriving away from their parents…how can you not miss that?! 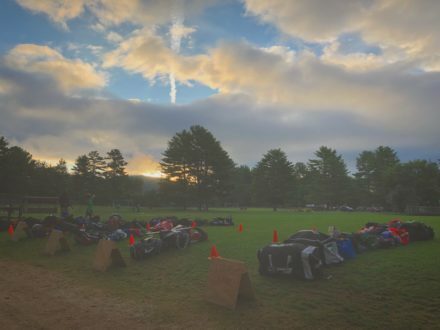 In addition to the clothing, bedding, and water bottles that came home in campers’ duffels, so too did the experiences, opportunities, friendships, and growth that they experienced at camp. They are proud of themselves. And yet, they are still processing this incredible experience, trying to make sense of not seeing the people that they lived with 24 hours a day for seven weeks straight. During the summer, campers gained self-esteem, built skills, tried new things and made lifelong friends. That doesn’t just disappear when you walk through your own front door. Campers are “campsick,” and it will take some time to readjust to being home. The challenge comes when campers have to face the elation of being home while dealing with the devastation of being away from camp. When you throw into the mix the anxiety-provoking start of the school year filled with tests, classes, sports, arts and social challenges, it leaves children feeling multiple contradictory emotions at the same time (happy and sad, excited and nervous, confident and secure). Your child just spent seven weeks as part of a group within a camp community. They want a little autonomy to determine what they eat, when they sleep, and what they wear (even if it is a t-shirt from camp that they wore yesterday too). Ease them back into the world of technology. They have just de-toxed for seven weeks with no screen time whatsoever. Allow them to reconnect, but to do so in an intentionally limited way. They don’t need to be overwhelmed by technology since they just learned to live without it. Let them sing their group sing song, camp songs, campfire songs, Tribal sing songs and the cheers that they did all summer long. These will lessen over time, but at least the songs are catchy, so if you can’t beat them…join them and sing along! Listen, listen, and listen again. Your child wants to share their camp experience with you. They want you to understand the joy that they felt, and the resilience they developed in both the good and bad times at camp. Living at camp for seven weeks is filled with personal growth and life lessons. Listening as they talk, asking them how they felt and finding out what they learned will help you to get a better idea of what their camp experience was like. Be beyond proud of them. Look at what they did! Your camper went to camp for seven weeks. They trusted you that camp would be great for them, and it was. Remind them that they enjoyed the good times, handled the challenges and learned from it all. Be proud that they had a successful summer of building friendships, trying new things, being part of a group, being away from home and figuring out who they truly are, and who they want to be. Follow your child’s lead in terms of reconnecting with home friends, and staying in contact with camp friends. Some campers only want to reconnect with home friends, while others only want to call, text or get together with their camp friends. Many fall somewhere in between, embracing their home social life, while not wanting to let go of their camp social life. There will be time to see school friends and to schedule camp-friend sleepovers. Let your child determine how and when they want to do each. Tell them that you love them and missed them, and that you are so happy that they had an amazing summer at camp. Allow them to feel good about everything that they accomplished and enjoyed while away from home. It is a great life lesson to learn that you and your parents can love each other very much, and still have safe, happy, growth-filled experiences away from each other. Remind them that ten months is a long time before they have to leave home for camp again, and at the same time, remind them that in only ten months, they will be able to return to camp. Let them embrace the moment of being home as they store up excitement about the summer to come. Let them look at all the photos on the camp website that you combed through all summer long. Let them read the camp blog to relive the memories that they made, and also the Trail newsletter when it arrives. Schedule playdates and sleepovers with camp friends during the year. Let them continue camp traditions at home if they want to. Bring them to camp winter reunions and events. Send us photos of your child with their camp friends, of them wearing their CEL gear during the year and also of any accomplishments that they are proud of. The Camp Echo Lake community lives on 12 months a year. You can take the camper out of camp, but you cannot take the “camp” out of the camper. You gave your child an incredible, life-impacting, growth-filled, happy summer camp experience. They will never be the same as they were before. You gave them the gift of camp, and they came home filled with a warm inner glow. Give them a big hug from us. We miss them a lot. Although we need these ten months to prep, plan, and grow, we are counting down the days until summer 2019!